Golden Gate National Parks Conservancy, National Park Service. 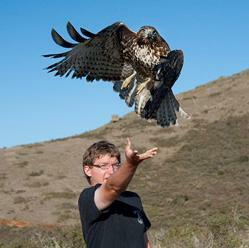 To conduct long-term studies of the seasonal movements of birds of prey along the Pacific Coast, particularly over the Marin Headlands, to further the understanding and preservation of raptor populations. Hawkwatch: identify and tally 19 species of birds of prey, so that data from different years can be compared. The count results help GGRO look for trends and patterns in hawk populations over time. Banding: answer questions about what raptor populations GGRO is tracking in the count studies – what are their geographical ranges? Recoveries also give us insight into causes of raptor injuries and deaths. Banding hawks gives us a rare opportunity to study them in hand, to check its physical health, weight and condition. Radiotelemtry: study daily timing of migration, the hawk’s habitat use, and even the human impacts on migration. Hawkwatchers scan the sky and count migrating hawks from Hawk Hill as they pass through the Headlands. Hawkwatchers meet in the Headlands at about 8:45 and count from 9:30 to 3:30 on Hawk Hill, then come back to the office to do some paperwork before leaving at 4 or 4:30. Hawkwatchers work under the leadership of an experienced dayleader. Hawks are counted systematically using a repeatable method, called the Quadrant System. Banders sit in small banding blinds in the hills of the Headlands, trap and band raptors and take measurements on them. Bander field days generally start at 7:45a.m. and last sometimes until the evening, depending on weather and bird activity. Radiotelemetrists place a radio tag on a hawk and follow its movements for as long as possible. The season is short, just two weeks in the middle of the migration, but it is intense work, lasting all day every day. Volunteers must be 18 years of age and be able to commit to one regular day every two weeks between mid-August through early December; all training is provided. Volunteer activities take place in the Marin Headlands. GGRO asks telemetrists to have at least one year’s experience volunteering as a GGRO bander or hawkwatcher before they become telemetrists. Hawkwatcher trainings occur at the end of June, and in July; the count starts mid-August and goes through the beginning of December. Bander trainings and workdays are more rigorous for banders, so there is a bit of a larger commitment. The trainings occur on weeknights and weekends in July and into the beginning of August. For Radiotelemetrists, there is also a bit of work and training involved to prepare for the season. All three meetings are the same. Please choose one to attend. These recruitment meetings will be held at the Golden Gate National Recreation Area headquarters, Building 201 at UPPER Fort Mason, in San Francisco. Enter Fort Mason at Franklin and Bay streets. At the stop sign, Building 201 is the large white building on the left with the green roof. Enter at the side door; look for a big GGRO sign. Annual Raptor Report are published online and telemetry tracking is published through a blog. Data is used by Raptor Research Foundation, Hawk Migration Association, North American Banding Council, Western Field Ornithologists, National Audubon Society, American Birding Association, American Ornithologists’ Union, North American Bird-Banding Association, among others. Hawkwatch and Bander season is mid-August through the beginning of December. Radiotelemetrist season is short, just two weeks in the middle of the migration, but it is intense work, lasting all day every day.